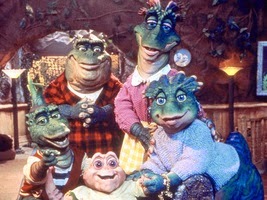 This week we will be looking at the dinosaur that started it all. (sort of) Say hello to the mighty Megalosaurus! Megalosaurus bucklandii was a meat-eating dinosaur that lived in what is now Oxfordshire, England, during the middle Jurassic Period, about 166 million years ago. From snout to tail Megalosaurus is estimated to have been about thirty feet long but since a complete skeleton has yet to be found, this number is subject to change. The genus name, Megalosaurus, translates to "Big lizard/reptile" because at the time of its discovery, its bones were thought to have belonged to a large lizard and not a dinosaur. (The idea of a dinosaur wasn't invented yet!) Despite the fact that we know dinosaurs aren't lizards now, many are still given "saurus" as part of their names anyway. The species name is in honor of Professor William Buckland, who studied much of Megalosaurus' bones. Despite only being known from fragmented remains, consisting of a leg, a hip, some vertebrae, the tip of the snout, and a few teeth, Megalosaurus is a very monumental find because it was the first dinosaur officially named by science. Megalosaurus was NOT the first dinosaur fossil ever discovered by humans, mind you. People have been digging up prehistoric dinosaur bones for thousands of years. They just were not calling them dinosaurs. It is likely dinosaur, and other prehistoric animals, were the inspiration for many of the monsters seen and told about from the mythologies and folklores around the world. 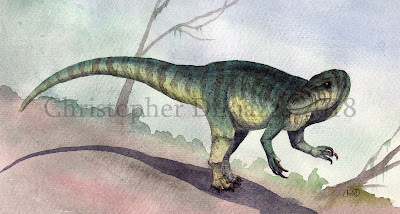 Megalosaurus was, however, the first dinosaur to be studied and officially referred to as a dinosaur. It first happened in 1676 when a piece of a leg bone was uncovered that baffled everyone. It was much too large to belong to any animal native to England at the time. At first it was thought to belong to a war elephant from ancient Rome and was later re-identified as belonging to a giant human, like the ones described in the Bible. 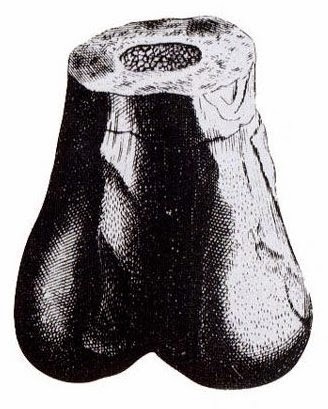 (which have since been confirmed never existed) This bone fragment was even given a scientific genus and species name, Scrotum humanum. It means exactly what it sounds like; "human scrotum". It makes me wonder if the scientists who named the fossil were early incarnates of Beavis and Butthead. 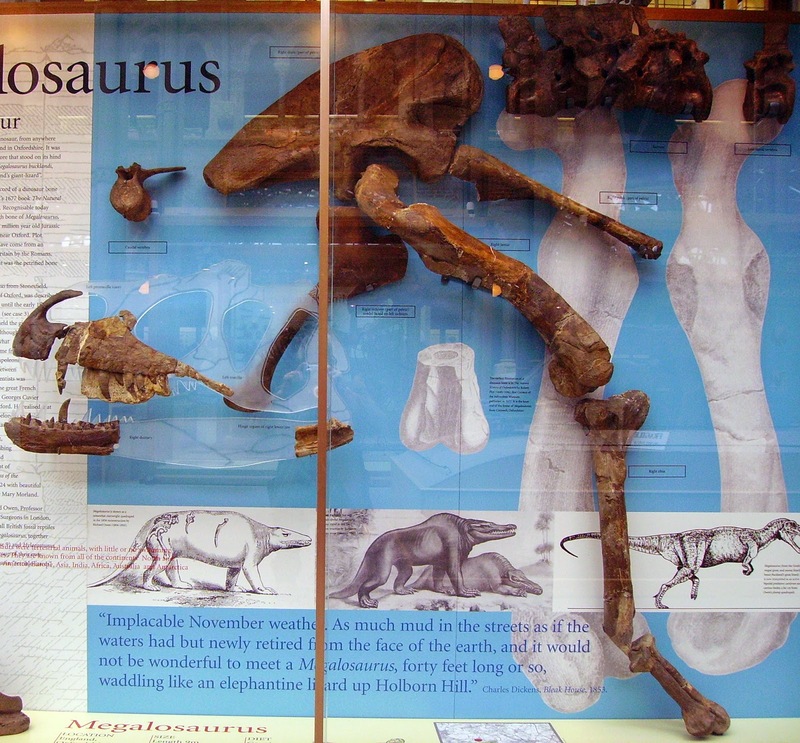 Megalosaurus bones on display at the Oxford University Museum of Natural History. In the 1840s, life-sized statues of Megalosaurus and several other species of prehistoric animals were erected in the gardens of the Crystal Palace in England. The palace itself, has since been destroyed, but the grounds where the statues are still remain in the form of a park now. Back then, since scientists knew much less about dinosaurs, Megalosaurus was represented as a large, lizard-like creature. We now know it would have looked very different. Megalosaurus statue at the Crystal Palace gardens. At the time of its construction dinosaurs were believed to have been much more lizard-like. When alive, Megalosaurus would have walked on its hind legs as an obligate biped. (Meaning it could not have walked on all fours even if it wanted to.) Although the front limbs were never found, it is likely, judging by other related theropod dinosaurs, Megalosaurus had three digits on each hand with a hook-shaped claw on the tip of each finger. Its teeth were sharp and somewhat laterally compressed to better slash the flesh of its prey. They also had small serrations for cutting meat while feeding. Although not much of Megalosaurus' anatomy is known, there have been other dinosaurs that share similarities with what we do have of Megalosaurus, like Torvosaurus from North America, which helps us guess what Megalosaurus may have looked like and also what it was related to. Because Megalosaurus was discovered first, the entire family which includes it and its relatives like, Torvosaurus, is called megalosauridae. It is also believed that megalosaurids share a relatively recent common ancestor with spinosaurids. I know the daughter has a frill but they were still Megalosaurus apparently. Benson, R.B.J. ; Barrett, P.M.; Powell, H.P., & Norman, D.B. (2008). "The taxonomic status of Megalosaurus bucklandii (Dinosauria, Theropoda) from the Middle Jurassic of Oxfordshire, UK". Palaeontology 51 (2): 419–424. Benson, R.B.J. (2010). "A description of Megalosaurus bucklandii (Dinosauria: Theropoda) from the Bathonian of the UK and the relationships of Middle Jurassic theropods". Zoological Journal of the Linnean Society 158 (4): 882. Buckland, W. (1824). "Notice on the Megalosaurus or great Fossil Lizard of Stonesfield". Transactions of the Geological Society of London. 2 1 (2): 390–396. Carrano, M.T. ; Benson, R.B.J. ; & Sampson, S.D. (2012). "The phylogeny of Tetanurae (Dinosauria: Theropoda)".Journal of Systematic Palaeontology 10 (2): 211–300.